Flash floods and landslides triggered by torrential rain hit Indonesia’s Cyclops Mountains in Papua province on March 17, killing nearly 90 people and displacing thousands. The country’s disaster mitigation agency has cited human-caused deforestation as contributing to the scale of the damage. Indonesia’s environment ministry has called for a review of zoning plans for the housing settlements around the Cyclops Mountains, but denies that massive logging has occurred in the area. 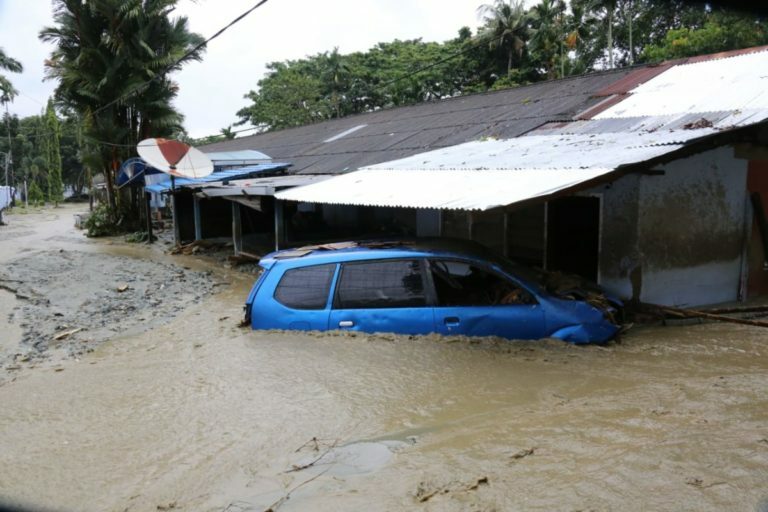 JAYAPURA/JAKARTA — Rain-triggered flash floods and landslides that struck Indonesia’s easternmost province this past weekend have killed nearly 90 people and driven thousands from their homes. The country’s disaster mitigation agency has cited human-caused deforestation as having exacerbated the scale of the damage. The flooding and mudslides destroyed buildings and roads in several areas of Jayapura district, in Papua province, on March 17. The district, in the foothills of the Cyclops Mountains, was reportedly drenched in heavy rain for seven hours non-stop. The rain caused Papua’s biggest lake, Sentani, to overflow, causing flooding in at least nine administrative villages in its vicinity. Map of Indonesia’s Papua province in green.Image by Bwmodular via Wikimedia Commons (CC BY-SA 3.0). 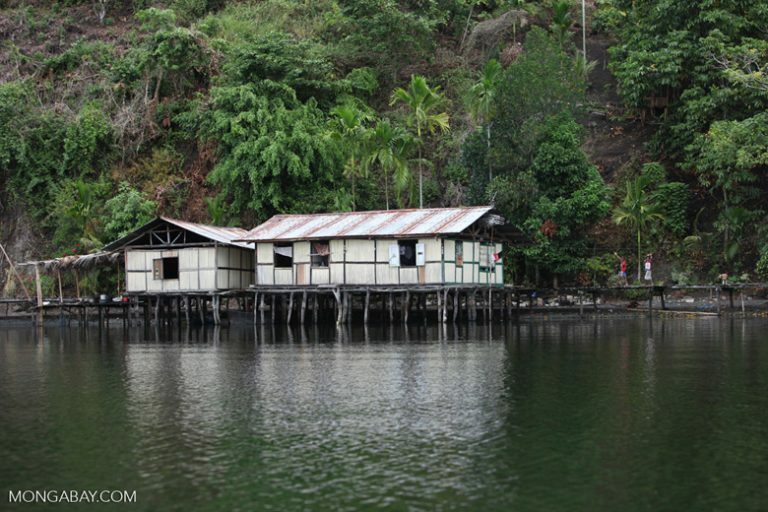 Homes on stilts on Lake Sentani near Jayapura and the Cyclops Mountains. Image by Rhett A. Butler/Mongabay. By March 19, the death toll from the disaster was reported as 89. Rescuers evacuated more than 6,800 people to temporary shelters, and more than 600 houses and buildings were damaged and submerged, according to official data. As the floodwaters subside, some people have begun returning to their homes to collect what little remains. Kindena Kogoya lost three of her children and her grandmother when a landslide struck her home on the night of March 17. Two other members of her family are still missing. 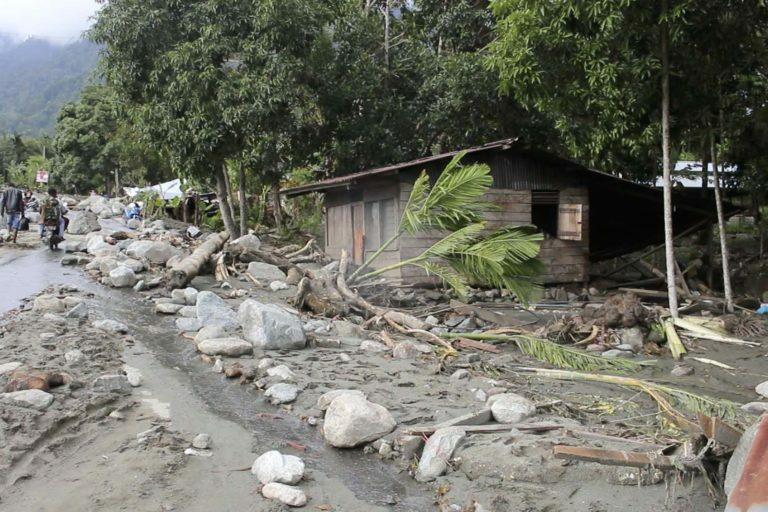 Rocks and uprooted trees carried by floodwaters and landslides hit hundreds of houses in Jayapura, Papua province. Image by Asrida Elisabeth/Mongabay Indonesia. 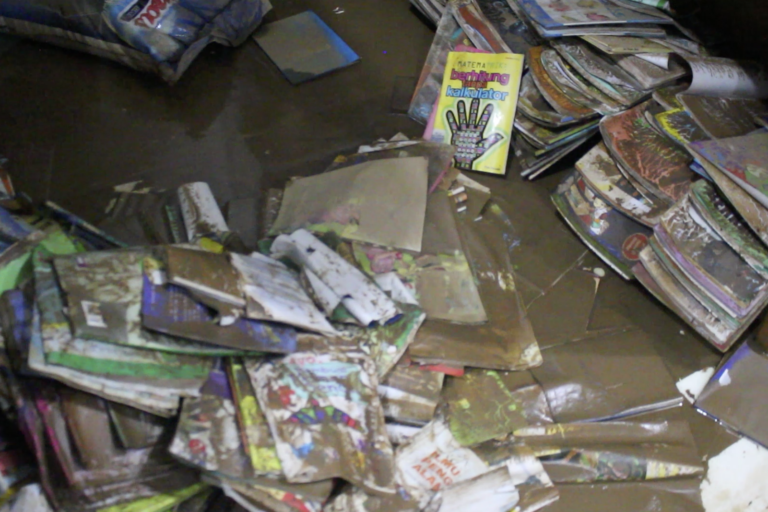 Mud-covered school books in Jayapura. Schools were shut across the district after the disaster. Image by Asrida Elisabeth/Mongabay Indonesia. Rescuers use heavy equipment to aid in their evacuation efforts. Image courtesy of the Indonesian National Disaster Mitigation Agency. 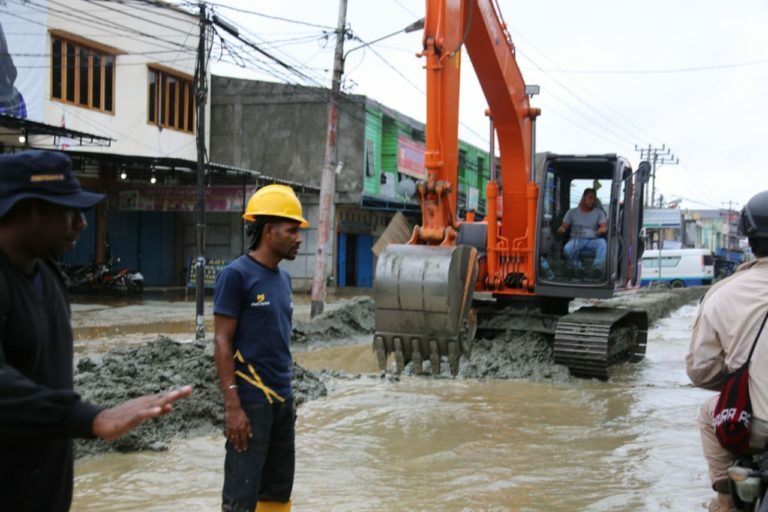 Heavy rainfall and the region’s montane topography were not the only causes for the flash floods and the scale of the subsequent damage, said Sutopo Purwo Nugroho, a spokesman for the National Disaster Mitigation Agency (BNPB), in Jakarta on Tuesday. Sutopo said 21.5 square kilometers (8.3 square miles) of land there had been deforested and degraded since 2013 for public housing, farmland, and small-scale mining. The area, he said, was supposed to have been off-limits for development as a water catchment zone. Population pressure is also a likely factor, Sutopo said, given that more than 43,000 people had moved into the area since 2013. The Cyclops Mountains, a coastal range spanning 314 square kilometers (121 square miles) of forest, is a designated nature reserve, but human encroachment has become one of its biggest threats. Amos Ondikeleuw, the leader of an indigenous Papuan community living at the foot of the range, told Mongabay in 2017 that outsiders were logging the forest and using fire to clear land for farming, encroaching on terrain that his community considered sacred. The extent of critically damaged lands in the reserve reached 7.2 percent in 2012 and was expected to increase in the coming years, according to the Jayapura district forestry office. The office also received reports of rivers running dry due to the annual decrease of freshwater discharge in the district. Deforested slopes in the Cyclops Mountains are prone to landslides. Image by Rhett A. Butler/Mongabay. The government has deployed rescue and evacuation teams and emergency aid to the affected areas, Sutopo said. Several hospitals in the area were also reopened by March 19. Experts say forest degradation in the buffer zone of the Cyclops Mountains has contributed to the imbalance in the area’s hydrology and ecology. “Rock digging near the rivers can reduce the soil’s endurance against pressure,” making it more prone to landslides, said Prihananto Setiadji, a geologist at Cenderawasih University in Jayapura. The environment ministry has called for a review of zoning plans for housing settlements around the Cyclops Mountains, but denies that the area has suffered a massive incursion by loggers. Ministry data show that primary forests in the Cyclops Mountains shrank by 10.5 percent between 2012 and 2017, to 58.4 square kilometers (22.5 square miles). Secondary forest increased by 9 percent during the same period to 23 square kilometers (8.9 square miles). These forests serve as a water catchment during heavy downpours, according to the ministry. 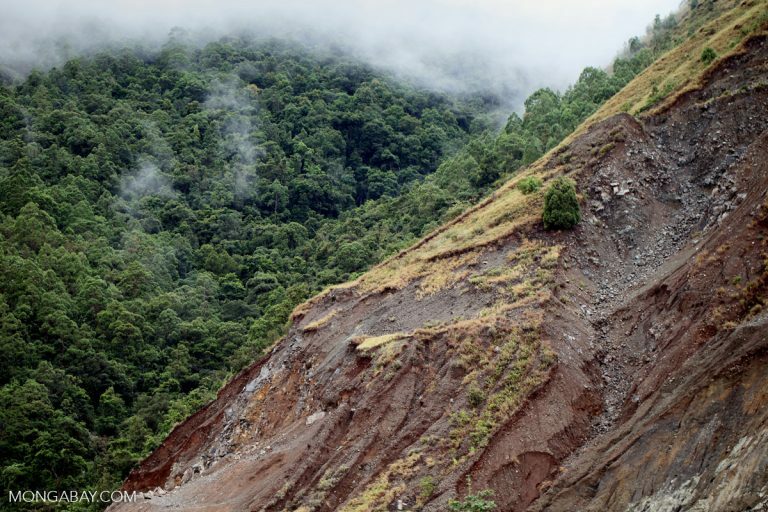 Wiratno attributed the severity of the landslides on the steep slopes in the area. 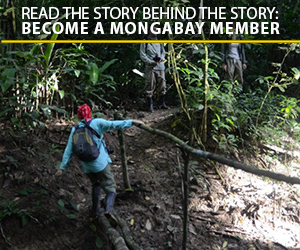 “Even though the forest isn’t degraded, when it’s at a steep angle, coupled with extreme rainfall, it will cause a big impact for the developed [downhill] area there,” he said. Wiratno said the environment ministry would increase its target for forest and land restoration in Papua to 25 square kilometers (9.7 square miles) from the initial 10 square kilometers (3.9 square miles), and develop efforts to improve soil and water management in the region. The ministry will also deploy a team to investigate the most recent disaster in Jayapura. “We will collect the facts as accurately as possible, and try to reconstruct the landslide so we can get a more comprehensive picture of what caused the landslide and what were the contributing factors,” said M. Saparis Sudaryanto, the ministry’s director of watershed planning and evaluation. Houses, office buildings, roads, bridges and public facilities across Jayapura were affected by the disaster. Image courtesy of the Indonesian National Disaster Mitigation Agency. This story was first reported by Mongabay’s Indonesia team and published here and here on our Indonesian site on March 18 and 19, 2019.